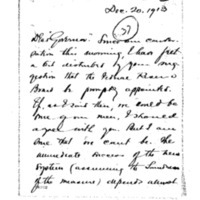 William G. McAdoo writes to Woodrow Wilson about appointing appropriate men to the Federal Reserve Board. Dear Governor. Since our conversation this morning, I have felt a bit disturbed by your suggestion that the Federal Reserve Board be promptly appointed. If, as I said then, we could be sure of our men, I should agree with you. But I am sure that we cant be. The immediate success of the new system (assuming the soundness of the measure) depends almost wholly upon this Board. It must be composed not only of able men, but men who are in sympathy with the purposes of the bill and the aims of the Administration, and it is essential that they shall be acceptable to your Secretary of The Treasury. Team work of the best sort is going to be necessary. My difficulties and responsibilities are great, and if I should be associated with uncongenial men,who would not work loyally and unselfishly, my usefulness would be greatly impaired if not destroyed. We must go carefully and deliberately about these selections. The only reward I ask is to be fully consulted about this very vital matter before conclusions are reached. In saying this, you must not infer that I, for one moment, believe that you would intentionally act without advising with me on this subject. Knowing of your large cares and the pressure upon you, I am sending this merely as a reminder so that you may not, by chance, forget or overlook the supreme importance to me personally and to the success of the system of right descicisions about the personnel of the Board. I have no desire on Earth except your success and the good of the country and that must be my excuse for these lines. PS Here is a fine telegram from the Banks of Baltimore. McAdoo, W. G. (William Gibbs), 1863-1941, “William Gibbs McAdoo to Woodrow Wilson,” 1913 December, WWP18235, First Year Wilson Papers, Woodrow Wilson Presidential Library & Museum, Staunton, Virginia.